Celebrate a special occasion at Armani’s high atop the Grand Hyatt. : For all its ambience and luxurious style, Armani's also makes itself accessible. Guests can always order from the menu, or create their own appetizer from the dramatic antipasto display. 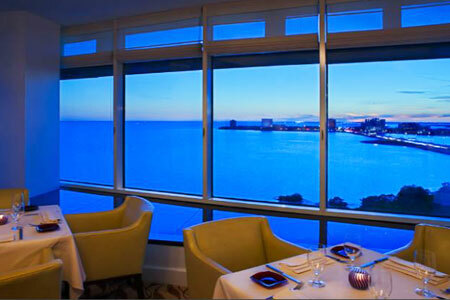 Located on the 14th floor of the Grand Hyatt Tampa Bay, the restaurant features unobstructed views of Old Tampa Bay and the Tampa International Airport. Such spectacular surroundings no doubt lend to the restaurant's chichi reputation, but make no mistake --- the food can hold its own. From Armani's signature lobster bisque to a warm salad of asparagus, fried duck egg and a flurry of shaved black truffle, it screams indulgence and "special occasion." Veal scaloppini and seared catch of the day with shrimp bordelaise, crushed potatoes and arugula are characteristic of the tantalizing entrées featured on the menu. Complete your meal with hazelnut cheesecake or house-made gelato. The wine list is just as impressive as the rest of the dining experience. For a panoramic view in two directions, try to secure the four-top that sits in an intimate corner of the restaurant. Otherwise, settle for a cocktail on the balcony, and still feel as though you've enjoyed the Armani mystique.